The 80% wool/ 20% nylon mix, developed by Brintons in the 1950’s: the softness of wool combined with the strength of nylon creates the perfect carpet yarn. 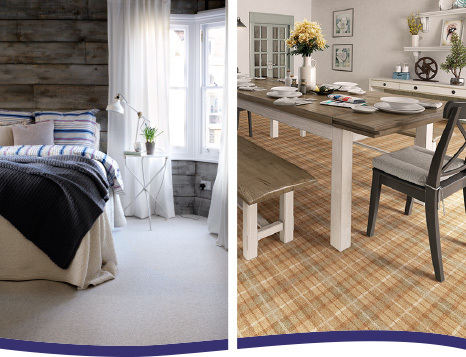 Axminster is a way of making woven carpets that offers greater pattern definition. Most Axminster carpets are patterned. Carpet yarn made from a mix of more than one fibre colour, giving a flecked, multicoloured effect. The pile is the bit you stand on. “total pile weight” refers to the amount of yarn used to make the carpet. Deep-pile carpets tend to feel more luxurious, while more rows of yarn are harder wearing. Tufts of yarn are punched through a backing membrane and secured by latex. This is a less time consuming, and therefore less costly, process than weaving, however this does mean the construction of the carpet isn’t solid.